LondonJazz News: For you to be performing in London with Karin Krog is surprisingly rare. What kind of repertoire can we expect? 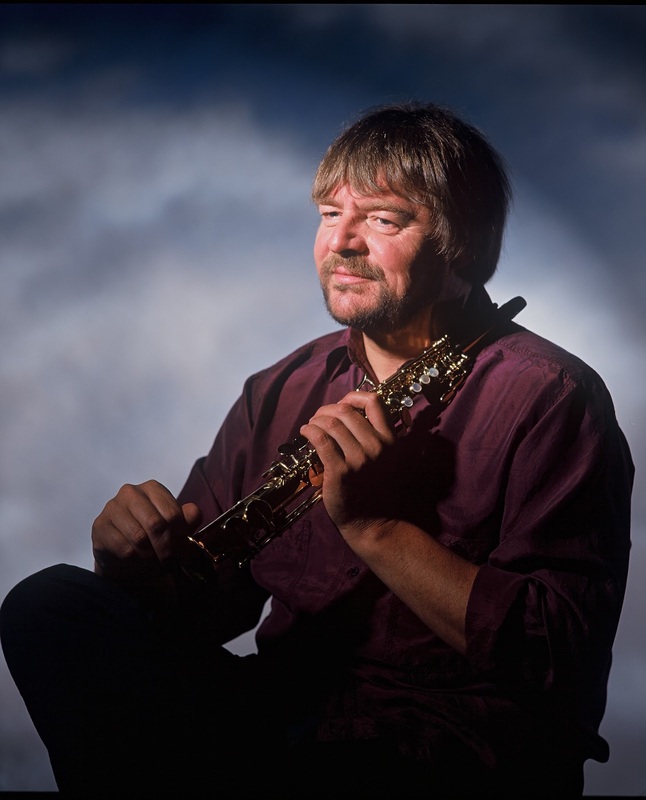 John Surman: I think it’s fair to say it would be a mixture of things. Since the beginning of the 1980s, some 35 years ago, when we both began to work together as a duo we both have been doing quite a lot of different things, both together and individually. So in a sense it has to be a mixture. One thing, however, will be unusual and a bit different. I have felt that people, particularly in England, have very rarely heard Karin sing straightforward standards or ballads with accompanying keyboards. So, from this perspective, I will play the piano and will accompany Karin on a few songs. This is something we have not done at our gigs and I want people to hear and experience that. It will be somewhat different and exciting. There also will be some taste of vocal effects and Karin using some electronics. There will also be some improvised stuff between the saxophone and the voice - quite simple, just saxophone and voice. All of these things would be put together with backgrounds in a spirit of the record called Bluesand. Just us two, so the format will be like in the past! I still remember one of the first gigs we did together, which was, I think, in Amsterdam… yes, and I certainly remember the synthesizers because I still feel the pain from lifting them up! LJN: The synthesizers must have weighed tons back then? LJN: The first album you and Karin recorded together was Cloud Line Blue, a moving and uniquely beautiful piece of music, and which gained a cult status continues to be still impressive. How did this project come about? LJN: Was it then you decided to work on an album together? JS: It was later that we met in Nuremberg in the early '70s. I was on tour with the trio then. Karin said to me that she would like to use electronic devices, but it was very difficult in those days and nobody really in a jazz world was doing that much – the jazz police, as we call them, were not enthusiastic. I agreed with Karin as I had the same problem, I loved synthesisers… and it was difficult… And Stu Martin said: “Well, you should make a record together”! I said “OK” – so that’s how this involvement came about. I took some money that I had from working in Paris Opera and I said to Karin: “Come on over and we’ll record”. LJN: Who else was involved in the project? JS: There was a guy who worked in a large country house as a professional gardener and wrote poetry too - Paul Rowlands. We thought his poems were a very interesting, abstract and very powerful, and it just happened to fit the mood. I had some ideas, and all of the sudden the multitrack recording came out - when we started recording this suddenly became all the rage! Before, when both Karin and I started recording music, it went as far as mono and stereo and four tracks – and suddenly we had 64 tracks and I just wanted to use all 64 tracks! It was like you have a canvas to paint on, and suddenly instead of four colours you can use 120 colours, and that’s how I felt. So that’s why we used multitracking, and Stu Martin played some drums, and my ex-wife Janet Cooke played some keyboards parts. And basically, the rest was up to Karin. I had maybe one or two melodic ideas for Karin. Every track evolved slightly differently, but when Karin would record the vocal was a very important part of the work. Very often she might come very early in the process of recording, so I would hear what she was thinking and I would go and do more following her suggestions. LJN: And, as in the title track Cloud Line Blue Karin would often improvise when recording vocals? JS: Yes, absolutely! The tracks grew as we made them. Together we created an integration of our music. However, we came to the point when we completely ran out of money. LJN: It must have been expensive using all those 120 tracks? JS: Yes, and even then I don’t think it was the most expensive studio in London, but this was a self-production, and, as I often mention, you don’t go to jazz to become rich… I think, at that point, we had probably about half of the album mixed, and the other half mostly done. Some time passed by, Karin was doing whatever Karin was doing and I was doing whatever I was doing, and then, finally, one day Karin said: “I think I found the solution”. It was Polydor, they took over the project and paid to get it finished and put it out. So it was great! So that’s when we came to Norway, I brought the tapes over to Jan Erik Kongshaug – and there were many of them –in what was then Talent Studio (later Rainbow Studio) and then he got to work on them and it was finished in Norway and released on Polydor in 1979. LJN: And the rest, as they say, is history. Would you play anything from that legendary album in London on 13 November? JS: I don’t think we’ll play much music from the album, as we will be focusing on presenting a repertoire we had recorded as a duo… but, yeah, we will probably do Jonathan from Cloud Line Blue!